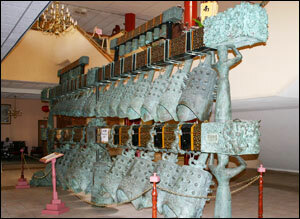 Under the staircase in the main entrance is a set of impressive antique Chinese Palace gongs. These are a replica of the original, which dates back approximately 2000 years to the Han Dynasty in ancient China. They are played by at least 2 people, using special wooden poles. The gongs were used to signal the start of various functions and the arrival or departure of various residents or visitors to the palace. They constitute an effective way of transmitting public information over quite an extensive distance. The gongs in the guesthouse, however, are only models and thus not intended to be played.